The ZR22/ZR402 Direct In-Situ Zirconia Oxygen Analyzer requires no sampling system and utilizes a long-life sensor, and is therefore ideally suited for measurement of oxygen concentrations in a high-temperature environment. 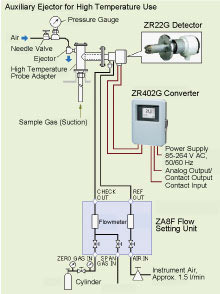 The ZR22G detector with the ZO21P high temperature probe adapter can be used in gas furnaces at temperatures up to 1400°C. Slabs are loaded on a conveyor and fed to a reheating furnace, which is heated to between 900 and 1400°C by burners that use fuels such as by-product gas. In order to keep the oxygen concentration between 1 and 2%, it is monitored in the preheat, heat , and soak zones. The slabs are heated uniformly without being oxidized, and then sent to the next processing stage. Note: the calibration gas cylinder must be purchased locally. The material selected for the high temperature probe adapter depends on the temperature of the sample gas. Follow instructions carefully when installing the probe.